First Line: Tordesillas, 1550. Midnight has become my favorite hour. C.W. Gortner does an excellent job of throwing light on a woman who has been shrouded in myth for centuries. Juana of Castile, daughter of Ferdinand and Isabella, was married to Phillip, the archduke of Flanders and sole heir to the Habsburg Empire. Juana's parents needed to strengthen their country, hence Juana's marriage and the marriage of her younger sister Catherine of Aragon to Arthur, heir to the throne of England. At first Juana's marriage is very happy, and she is content to be a wife and mother. 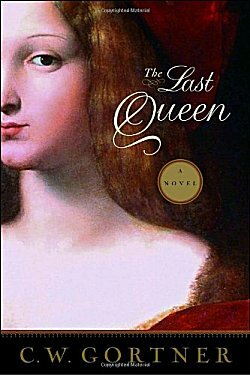 When Queen Isabella dies and Juana becomes the last queen of Spanish blood to inherit her country's throne, her life is thrown into chaos. The wealthy grandees who were supplanted by Juana's parents want their old rights and privileges back. Ferdinand is too busy trying to keep the various bits of the country together to help his daughter, and Juana's husband-- within the blink of an eye-- has turned power mad. He wants to be King of Spain, he wants it now, and he will stop at nothing to achieve it. Nothing. I read quite a bit of European history when I was in high school and college, and all I knew of Juana of Castile was her nickname: Juana La Loca-- Joanna the Mad. The nickname intrigued me because even then I knew that everyone who was referred to as mad wasn't necessarily so. If someone has something that you want, one of the best ways to get it from them is to make people believe they're crazy. Gortner portrays Juana as a brave, intelligent, and passionate woman whose strengths were used against her. The story is told from Juana's point of view, and as I read I became her staunch defender. I kept wondering why Isabella would send her daughter off with-- basically-- no weapons in her arsenal, no champions of substance to fight in her corner. It's as though Isabella thought she had super blood that would transmit everything to her offspring that her daughter could possibly need. As my own levels of anger and frustration mounted, I kept reminding myself of my reading all those years ago, those random mentions of Juana La Loca, and I knew what would happen, but that didn't keep me from becoming emotionally involved in a centuries-old story. It is true that winners are the ones who write the histories, but thanks to historians, teachers, and the talents of authors like C.W. Gortner, we can still learn about the losers, many of whom deserved much better than they received. I have to admit that I find history fascinating, Cathy. And that's especially true with the subject is someone who doesn't get the 'press' that some other famous people do. This really does sound interesting.